Hairl Hensley, one of the longest running announcer in Grand Ole Opry history, has died. Our entire staff is saddened to hear the news of the passing of our longtime coworker and friend, Mr. Hairl Hensley. Considered the Dean of Grand Ole Opry announcers, Hairl’s voice was heard over the WSM airwaves for many years. He became a member of the Country Music DJ Hall of Fame in 1995. Hensley had left the broadcasting business a decade ago due to health problems and had suffered a heart attack, going through triple bypass surgery on September 17. Hairl originally wanted to be a musician, learning the guitar while a teen and eventually joining a band that was regularly featured on WDEH in Sweetwater, TN. When the station's morning DJ was promoted, the job fell to Hensley. 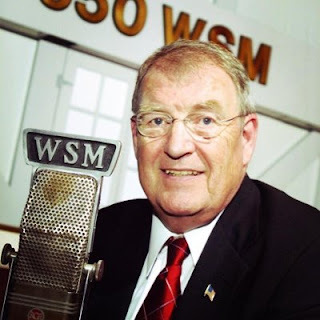 Hensley's road to WSM went through WNOX in Knoxville, WKDA and WMAK, finally settling as Program Director at WLAC. In 1972, he joined the staff at WSM and, in the early-80's, became the program director. When he left WSM, he became a host on the Sirius/XM Roadhouse channel. He also is the second longest running announcer for the Grand Ole Opry, serving in that spot for 35 years. Only Grant Turner had a longer tenure at 47 years (current host Eddie Stubbs is at 22). Hensley was the 1975 CMA Disc Jockey of the Year, the Bluegrass DJ of the Year for the Society for the Preservation of Bluegrass in 1996 and the 2000 Radio Personality Award winner at the Golden Voice Awards. He was inducted into the Country Disk Jockey Hall of Fame in 1996 and the Tennessee Radio Hall of Fame in 2014.